So one of the things I tried out recently is Run Gum. Again, I bought this myself and in no way am I connect with Run Gum. I saw some runners using it and I was interested and now I just want to let you all know what it’s like. I went onto Amazon in late January and decided to take the plunge and give it a try. I’ve been figuring out a new work/sleep/running schedule the last couple of months and have been struggling in the afternoon to stay alert so I was looking for something that I could use whenever I needed a pick me up, either before a run or during the day if I was starting to drag. So I put in my order for Run Gum! So it’s suppose to have about the same caffeine as a cup of coffee plus b-vitamins (which help me not get jittery) and because you are chewing it everything can get absorbed faster since your gums are a great way to get things directly into your bloodstream. So the first thing I noticed was that these do not look like regular gum. They are slightly smaller in diameter than a quarter and are pretty thick. They seemed more like a mint or something you’d see in a tube packaging. About the size of those larger sweet tarts. They also had a chalkier texture on the outside, not the usual candy coating that’s on most gum. So I popped it in my mouth and… it was… interesting. The chalkiness carries into the texture and you can literally break it into pieces in your mouth. It comes back together once you’ve chewed it for a bit but definitely a weird texture. The taste? It’s definitely an acquired one. I can’t remember if I tried the cinnamon or fruit flavor first but both are funky. I can’t really put my finger on it but I can’t chew it for more than a couple minutes without the taste just getting really, really bad. The mint was probably the best out of the three but that’s not saying much. Did it give me energy? Yes… maybe… hard for me to say definitively but I did have some strong morning workouts which I’ll say were helped by the extra boost that I got from Run Gum first thing in the morning. Did it make me jittery? No, I never noticed any jitters. So would I recommend it? Yes, if you were interested in trying it out I wouldn’t stop you but I would flag my recommendation with a huge caveat that you should be prepared for a weird texture/taste. It seems like a quick way to get a caffeine boost without having to drink a bunch of coffee and it’s portable which is a nice plus. 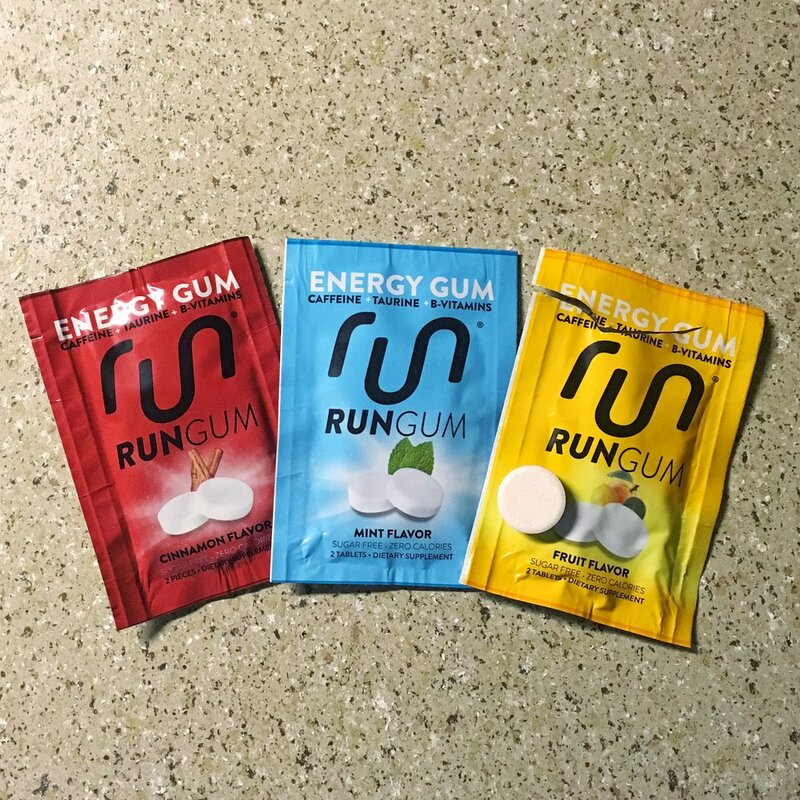 If you are doing an ultra or other long event where you might need a mid-run boost, this probably won’t mess up your stomach, but you also might want to try out some of the regular military grade energy gum on the market too. I’m definitely glad I tried it out! On made a big update to the Cloudsurfer and I also decided to try out its lightweight cousin, the Cloudrush! The newer lighter cousin of the Trekz Titanium is a hit! I love the motivation boost this box of running fun gave me! The BUFF® Run Pack Hat is light-weight and super packable. Great for your go anywhere type of running (which is kind of all running). Sleeves are cool - the keep you cool and protected. Tired of stinky, damp running shoes? These might help! Want a light alternative to the headlamp? Then check out Knuckle Lights! Come learn about the benefits of Algae and why ENERGYbits makes it easy + DISCOUNT CODE + GIVEAWAY! The #BibRavePro team reviews the AMPLA FLY shoe which uses technology to correct your form and give you more power! It's important to stay safe while your on the run. With the days getting shorter it means we need to stay visible in low light! The #BibRavePro Review the Trekz Titanium Pink! The BibRavePro team reviews the Trekz Titanium Pink which supports Bright Pink, an organization that supports breast and ovarian health!